An article published in the journal “Science” describes a research on the planet Saturn that includes an analysis of its internal structure but also on its evolution, which includes its rings’. A team of researchers led by Luciano Iess of the Sapienza University of Rome, Italy, used data collected by the Cassini space probe to determine that the winds on Saturn reach a depth of about 9,000 kilometers and that the rings were formed not more than 100 million years ago. The Cassini space probe completed its extraordinary mission on September 15, 2017 disintegrating into the planet Saturn’s atmosphere but the analysis of the enormous amount of data accumulated in over a decade continues. In the last phase of its mission, appropriately called the Grand Finale, the heads of the mission decided to have Cassini perform a series of Saturn flybys inside the rings, maneuvers that were previously considered too risky. This allowed to make some surveys that were impossible in other ways that also concern the age of the rings. The Cassini space probe’s trajectory with its speed instant by instant was reconstructed with great precision thanks to a microwave connection between it and the tracking stations on Earth. The gravitational effects of Saturn and its rings influenced that trajectory causing a continuous displacement and consequently a Doppler effect, which causes an influence on the connection’s frequencies. That information allowed to reconstruct Saturn’s gravitational effects and therefore to estimate its gravitational field and the mass of its rings, a piece of data that allowed to carry out evaluations on their age. Previous observations made by the Cassini space probe made it possible to establish that Saturn’s rings are composed of 99% of water ice and the rest of various impurities. They also allowed to determine the flow of microscopic grains of silicates around the planet. The estimate of the rings mass allowed to measure the amount of impurities accumulated and therefore to calculate the time needed for them to deposit. The result is definitely imprecise but indicates that the rings were formed in recent times from an astronomical point of view: between 10 and 100 million years ago. Luciano Iess reminded that various clues had already indicated that Saturn’s rings hadn’t been formed together with the planet and the researchers were already discussing the possibility that one of the planet’s icy moon had disintegrated or that they were born as a consequence of the impact of a comet. Knowing their mass was the crucial piece of data to understand something more and now the researchers estimated it in about 40% of Mimas‘s, precisely one of Saturn’s moons with a strong component of ice, known above all for a curious resemblance with Star Wars’ Death Star. This research provided more information about the planet Saturn such as winds reaching depths of around 9,000 kilometers, and gravitational field measurements that suggest that its core is made up of elements heavier than hydrogen and helium that make up about 15 percent of the planet’s mass, between 15 and 18 times the mass of the Earth. 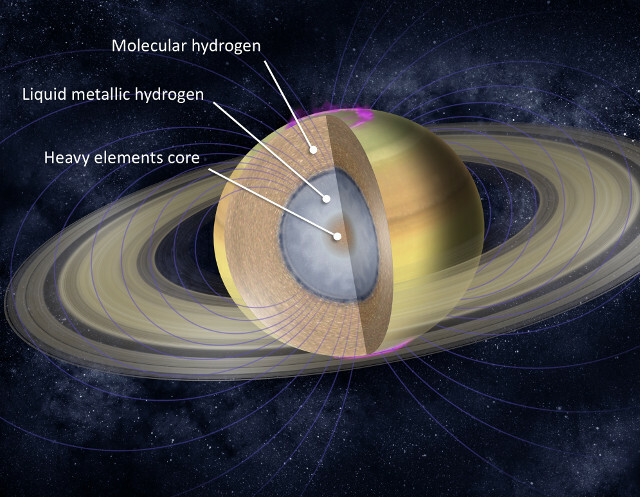 The image (NASA/JPL-Caltech for Saturn) shows a diagram of the planet’s interior with its three main layers: a core surrounded by a layer of liquid metallic molecular hydrogen and an outer layer of molecular hydrogen. Knowing better Saturn’s characteristics will allow to better understand how the planet and its moons were formed. However, the rings remain its most iconic feature and it’s interesting to know their age. They’re slowly losing their material, attracted to Saturn, so we’re lucky to see that show.